The transformation of the church over the past few decades has set the stage of the end times events the Bible speaks of, including the embracing of the one world religion and the acceptance by the church of the mark of the beast. The Bible speaks in Matthew 7 of people standing before Christ on the last day and saying Lord Lord. These people were clearly churched but not saved. If that term is foreign to you, be aware that it is not to your pastor. The term "churched" entered into the pastoral lexicon with the introduction of the Purpose Driven Church by Rick Warren. Not the Purpose Driven Life. The Purpose Driven Church was written for pastors in 1995 and is the blueprint for the unbiblical and destructive theories of church growth that have spread like a cancer throughout the body of Christ over the past 30 years. Terms such as "lost" and "unsaved" were considered negative stereotyping and replaced with less abrasive terms such as "unchurched." That may seem like a small thing but beloved it is not. It has radically changed the focus and goals of churches across this world. Instead of being concerned about the person's salvation, pastors today are concerned about whether they attend church. The problem is standing in a church doesn't make you any more saved than standing in a garage makes you a car. As the purpose driven movement took root and began to fester, we saw an entire support industry arise around it. National conferences on leadership and faux revival became big business. Almost as big as the churches themselves. Lakewood Church for example takes in over $600,000 per weekend in tithes and offerings. Kenneth Copeland has a net worth of over 600 million dollars and lives in a seven million dollar mansion that he writes off as a "parsonage." Besides conferences on leadership, we have seen the rise of Christian Leadership gurus who have entire businesses geared to raise up, grow and equip a generation of hirelings. The key verse reminds us that Jesus is the Good Shepherd whereas the hireling cares nothing about true doctrine because he ultimately does not care about the sheep. One such leadership guru, which I have featured before, is Carey Nieuwhof. His most recent article entitled, "When To Panic and When NOT to Panic When People Leave Your Church", can be found at the link above. As we once again reason together in review, keep in mind that this is written to pastors with the intent of teaching them. 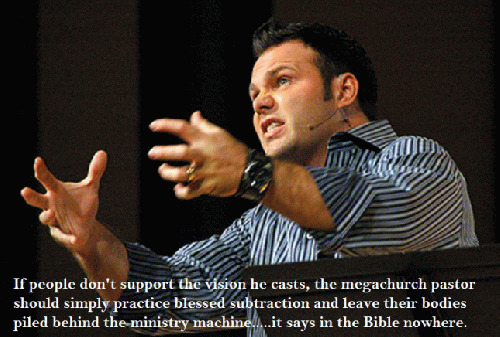 This is the absolute garbage your pastor is inundated with every day.